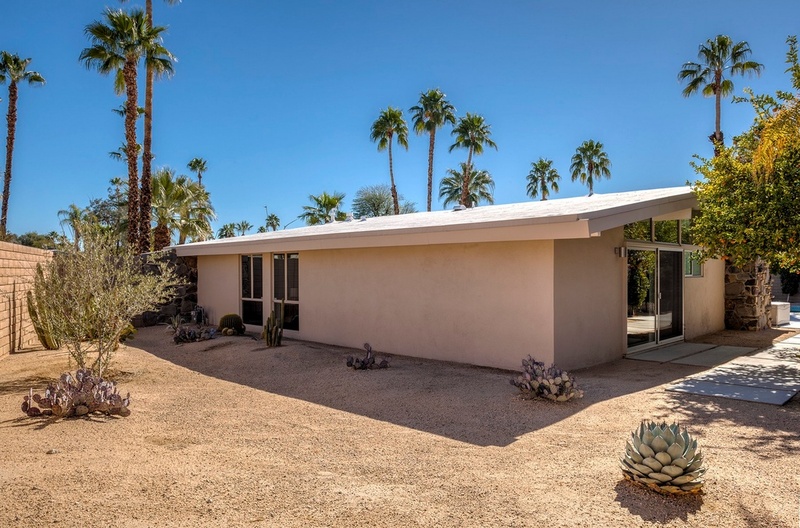 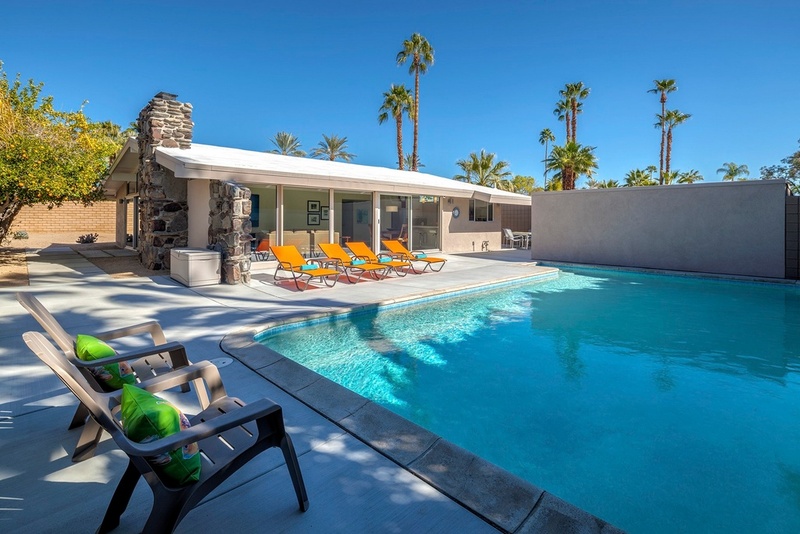 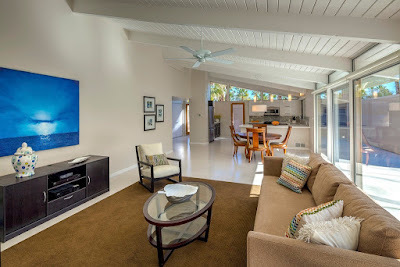 One of only 15 homes built in the Valley of the Sun subdivision in Rancho Mirage, CA is this 1958 Palmer & Krisel-designed midcentury modern home built by builder George M. Holstein and Sons. Recently undergoing a significant renovation, this home features three bedrooms and two bathrooms in 1,680 square feet, a two car garage and an in-ground pool all on a 10,000 square-foot cul-de-sac lot with an asking price of $769,000. 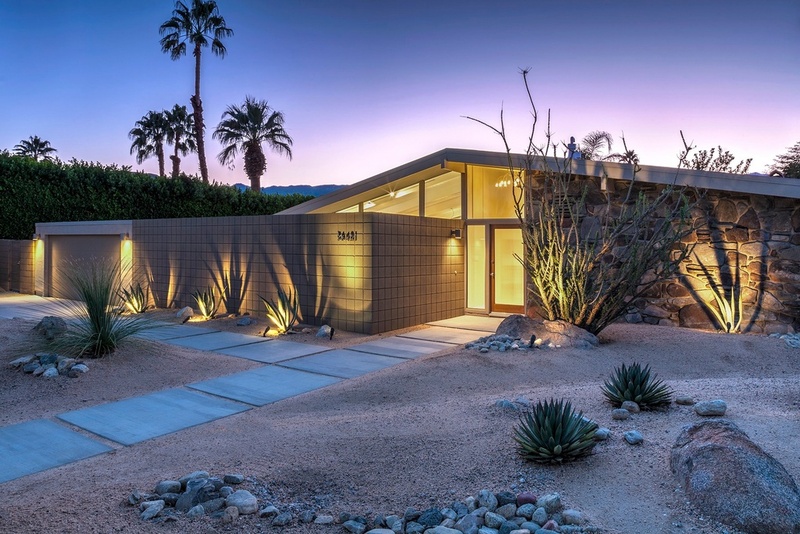 Night view - great job on the lighting! 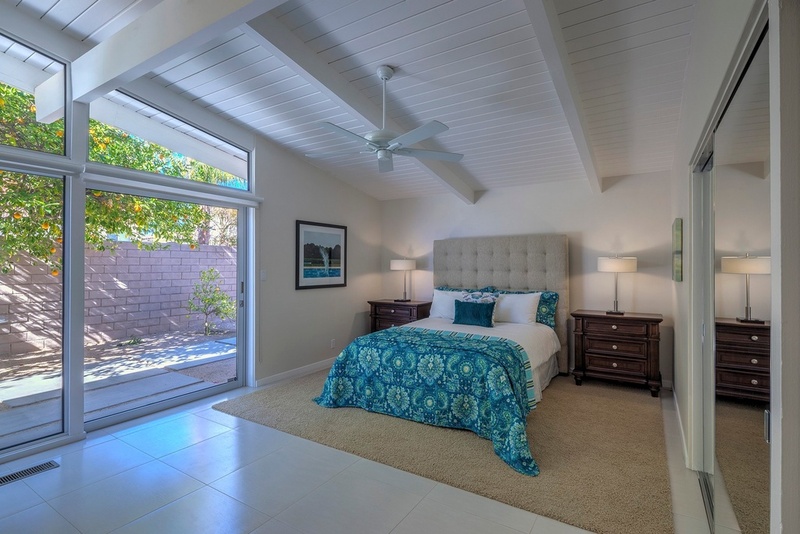 The home last sold four years ago at less than half of the current asking price and has undergone some very extensive renovations. 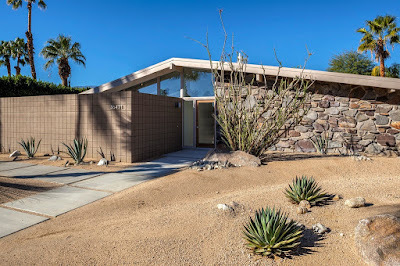 The front exterior of the home has been cleaned up and given a makeover, including freshened desert landscape and a new scored concrete block courtyard wall which replaced the original Krisel board-and-batten design. 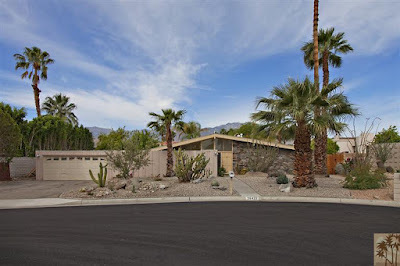 A matching scored block mailbox pedestal sits adjacent to the front walkway, while the exterior of the home has been painted a muted desert taupe. The entry hall carries through the board and batten texture on the wall, now slightly lost without original context (the lines of this wall would have visually extended outside following the lines of the original board and batten fence), and leads into a light-filled voluminous space. 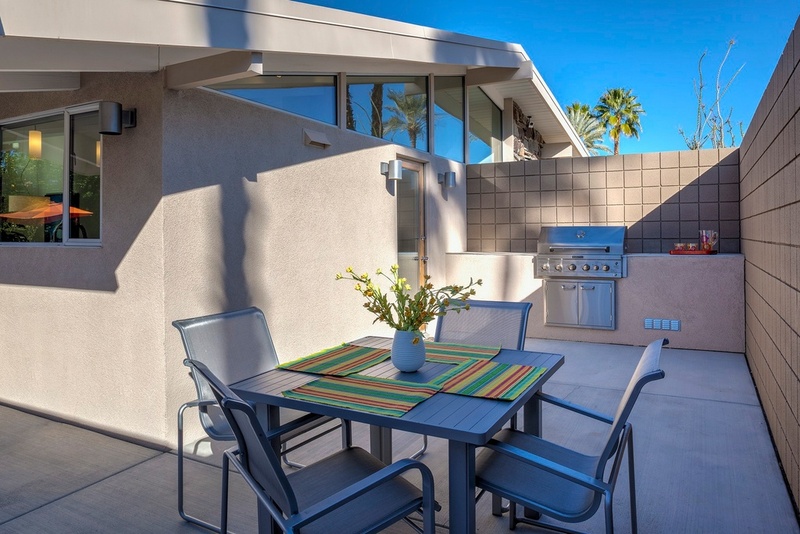 The living, kitchen and dining rooms all sit along the south side of the home, while the three bedrooms face north. 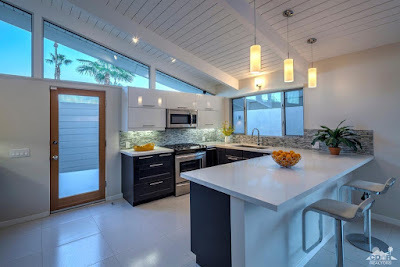 The kitchen has been opened to the dining and living rooms and features new white upper cabinetry with dark shaker-style lower cabinets, clean lined and low profile in style, replacing a non-conforming 1980s kitchen. 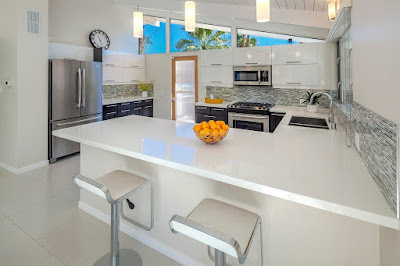 Composite counters, multi-tonal grey mosaic tile backsplashes and stainless steel appliance round out the room. 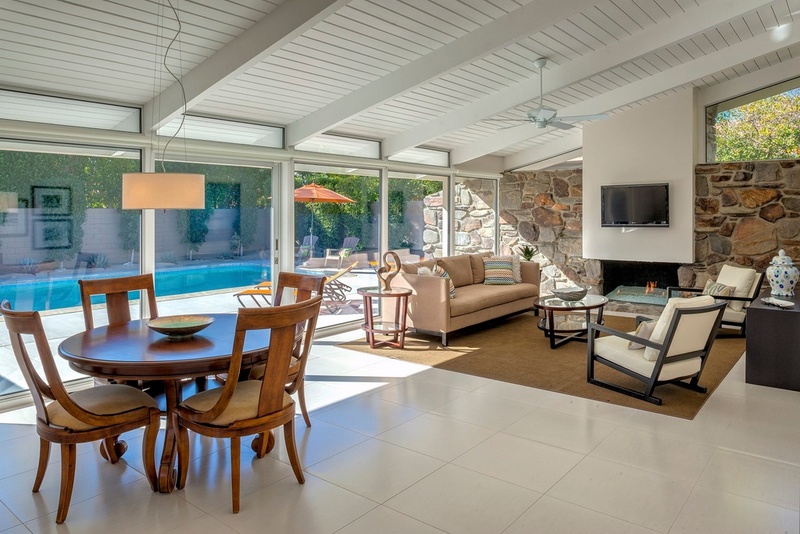 Original east-facing clerestory windows are still in place allowing the room to fill natural morning light. The living and dining rooms overlook the south-facing pool and patio area through floor-to-ceiling walls of glass. 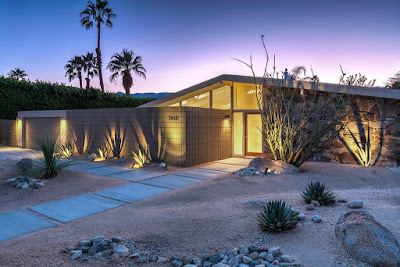 Open beamed vaulted ceilings add height to the space, while the western wall is comprised of thick desert stone and anchored by a signature Krisel modernist fireplace. White porcelain tile keeps the room light and bright, and west facing clerestories add additional natural light into the room. 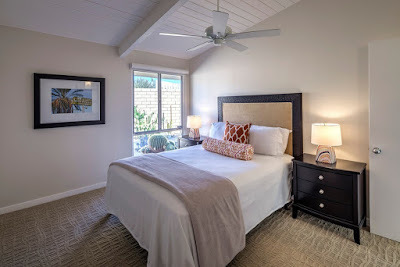 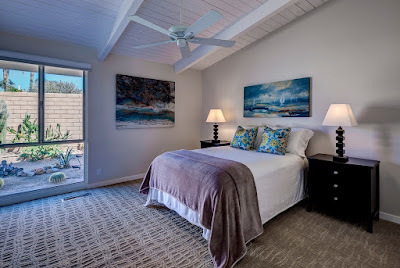 The master bedroom sits at the northwest corner of the home, and includes a large west-facing sliding glass door leading out to a private patio and additional rear yard area. 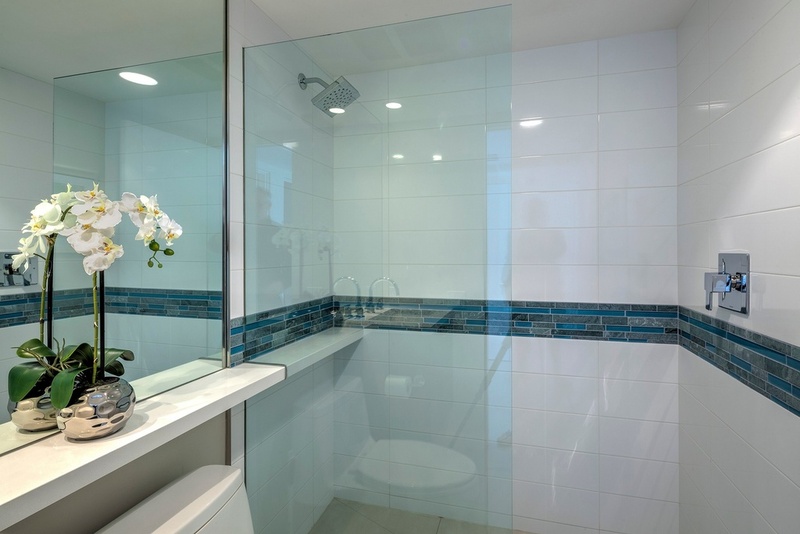 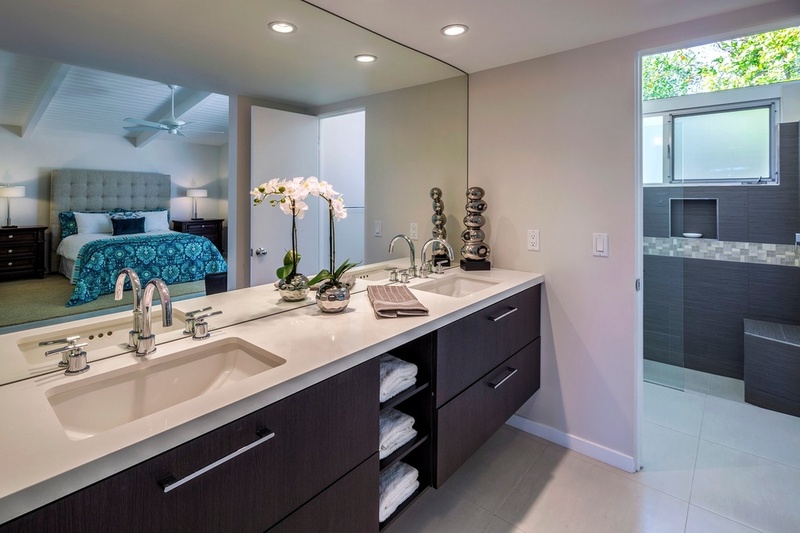 The master bath has been updated with floating vanities, new fixtures and a large step-in shower. The secondary bedrooms face north and remain in their original configurations while the guest bath has been updated with clean, sleek materials that well represent the modernist roots of the home. The backyard features several thoughtful touches, including an outdoor kitchen and barbeque area immediately off of the inside kitchen. 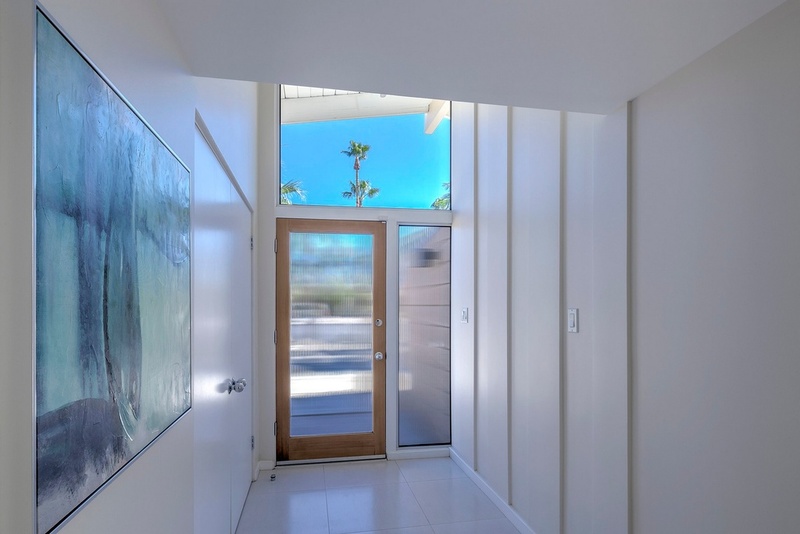 This in turn leads into a small patio area defined by the exterior wall of the two-car garage. 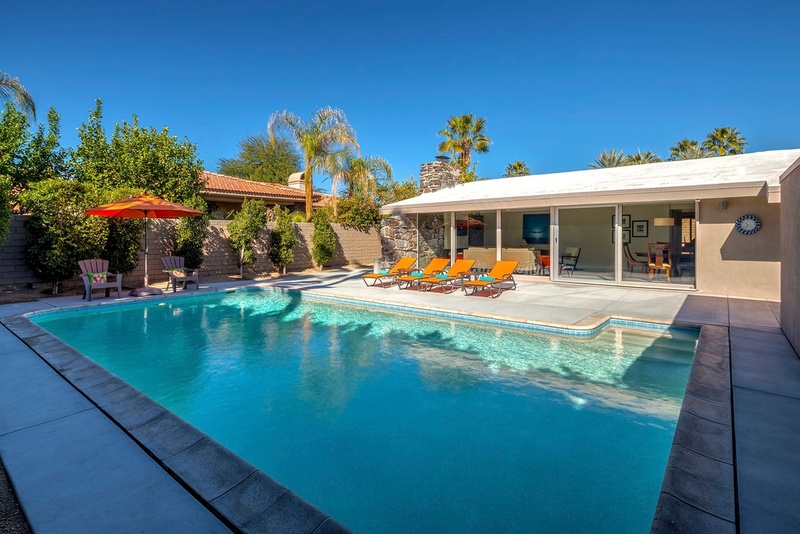 The large, rectangular swimming pool takes up a majority of the rear yard area, and lots of flexible entertaining hardscape makes up the rest of the area. The northern half of the yard has been preserved as low-maintenance desert landscape. Overall this is a stellar example of a well-renovated home with thoughtful details and well-chosen materials that respect the origins of the home. 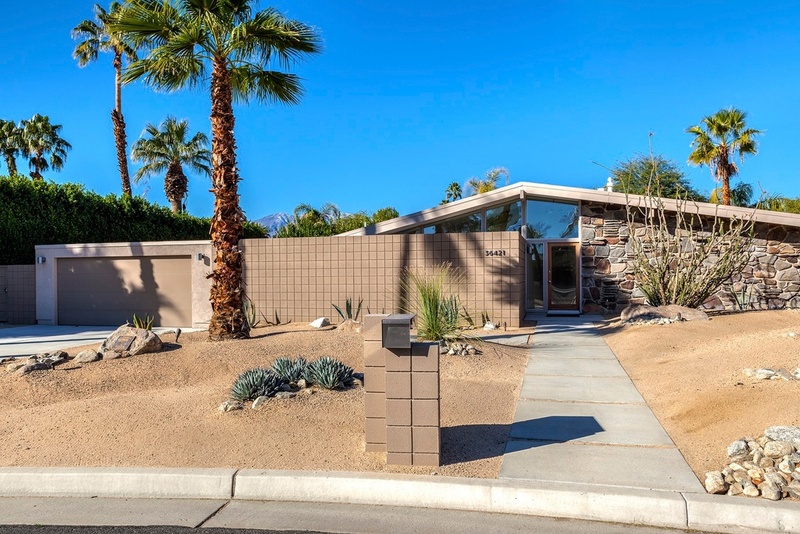 Most likely this property will be a quick sell, and offers a great piece of midcentury architecture for those looking to make a home Rancho Mirage. For a location map and a few additional photos of Valley of the Sun, take a look at our Valley of the Sun Gallery page.